This following list of premium WordPress themes focuses on security services and companies. As most companies, this niche has also seen a steady growth in the past couple of years in the online market. Whether your company is provides home security, corporate security, online security, or offers local services, a website is a powerful tool to have. This way you get the opportunity to present your services and business to a digital audience. The security services WordPress themes featured in here are some of the best options currently available on the market. They will make your work ten times easier and you will not have to hire a webmaster in order to teach you how to use them and create a beautiful presentation website. Check them out and see which one molds best to your style and needs. 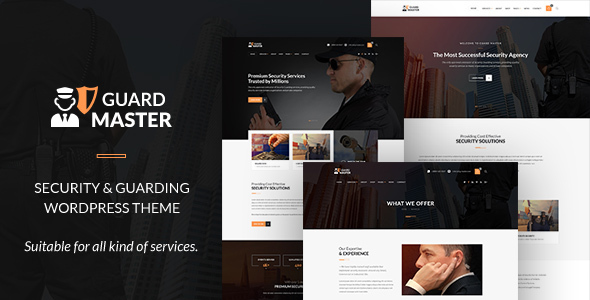 Bodyguard is one of the best security company WordPress theme you can choose. This theme has been crafted to fit this type of companies and it has a sophisticated and professional design as well as high quality functionality. Bodyguard is fully responsive and adaptable to all mobile devices and browsers. 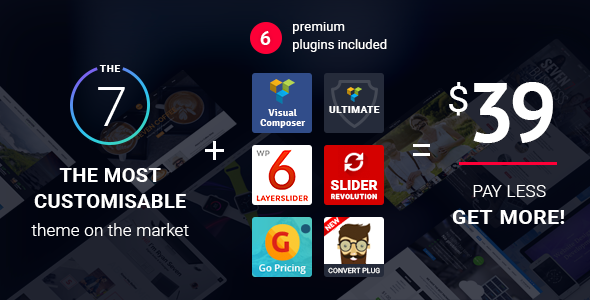 It comes with two powerful premium plugins: Visual Composer and Revolution Slider. Additionally, it also includes the demo content, Contact Form 7 support, custom shortcodes, Google maps, custom 404 page layout, and more. 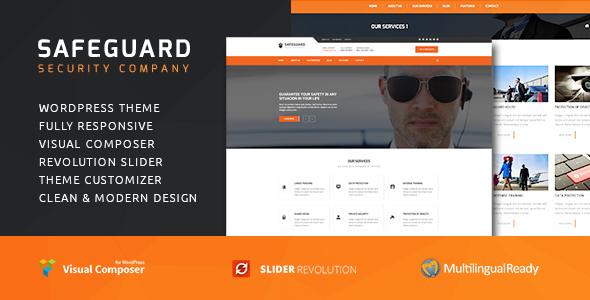 Add flavor to your website with Bodyguard! 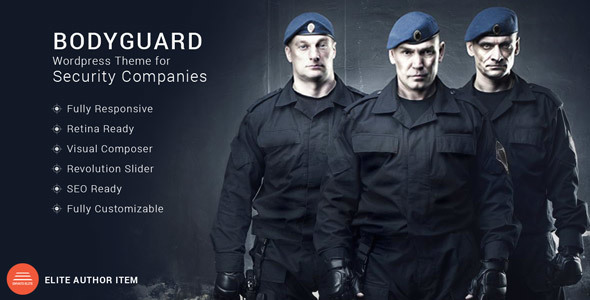 Guard Master has been designed and developed to be the perfect platform for security companies. The clean and modern design will impress your visitors and allow you to showcase your work and services. Guard Master has an impressive feature that allows you to try the theme out before committing. Guard Master is fully compatible with WooCommerce, CF7, and WPML. Moreover, it includes the demo content, Visual Composer, brand customizations, smart theme panel, and several page layouts and templates. 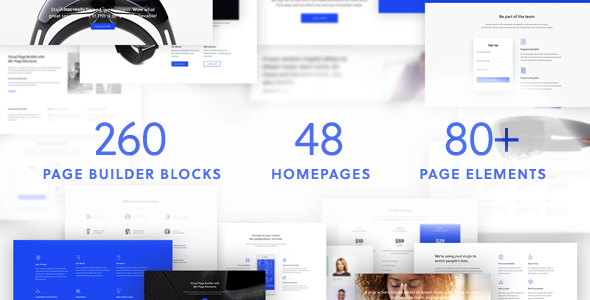 Everything in this theme is built to perfection, so give it a shot today. 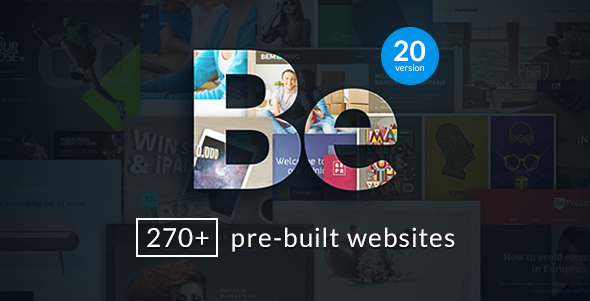 BeTheme is a one of a kind premium theme capable of adapting to literally any type of website. Its versatility and multiple theme features make it one of best choices for security services companies. Among the 280+ fully built and designed demos you will surely find one to fit your vision and style. And if you by any chance don’t find one, the theme is packed with customization options to craft a unique and modern layout without breaking a sweat. The team of developers behind BeTheme is constantly updating the theme, so you will always stay relevant and up to date. 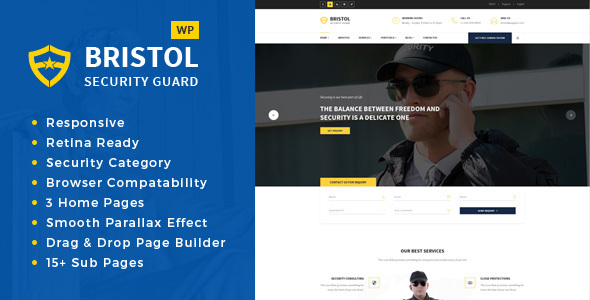 Bristol is a new and beautifully designed security and guarding services WordPress theme. It was crafted by a team of professional developers looking to provide a product that is easy to use, highly customizable, and visually stunning. The installation of this theme takes a few minutes at most and after activation beginners can install the demo content and advanced users can use the integrated Visual Composer to create unique page layouts. Regardless of the device or browser used, Bristol will look just as good because the theme is fully responsive and retina ready. 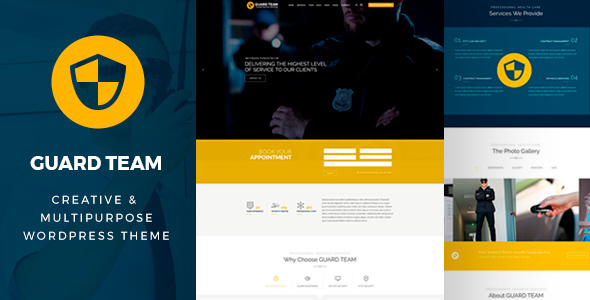 Guard Team is a simple, impressive, clean, and fully responsive security service WordPress theme. This theme will not fail to impress you and your audience with its beautiful design and intuitive features. Guard Team is a highly customizable theme and you do not have to go with a standard theme layout. Using the theme’s integrated Visual Composer drag and drop page builder you will be able to create any type of page layout you think of. Other features included are the demo content, Slider Revolution, font icon loader, multiple Google fonts, unlimited color panel, and a powerful theme customizer. Improve your digital presence with Guard Team! Mechanna is a gorgeous, outstanding, reliable, professional, pristine, premium WordPress theme for security services. It is full of modern features and comes with a 100% responsive layout that will adapt perfectly to all screen resolutions. Integrated in this theme comes a powerful drag and drop page builder to give you an advantage in customizing the theme. Mechanna also includes multiple layout options, content modules, custom widgets, a live customizer, 500+ Google fonts, and a clean and optimized code. Whether you are a beginner of advanced WordPress user, with Mechanna you can create the website of your dreams. 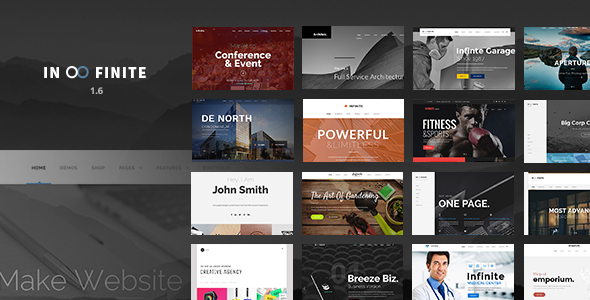 Infinite is a serious, appealing, sleek, gorgeous, modern, and resourceful multi-purpose WordPress theme. Infinite was developed using the newest technologies, with a clean and SEO optimized code, and offers an impressively responsive layout. The popular Goodlayers plugin comes integrated with this theme to help you design any type of layout you desire. Or you can choose one of the pre-built demos that also come with this premium theme. The admin panel offers tones of customization options and you save more than $70 in premium plugins. This is the easy way to build successful and professional websites. Try Infinite today! ProGuards is a creative, robust, flexible, and gorgeous WordPress theme. This theme packs a punch, and if you want to replicate the demo, you can do achieve that same look with only a few clicks. 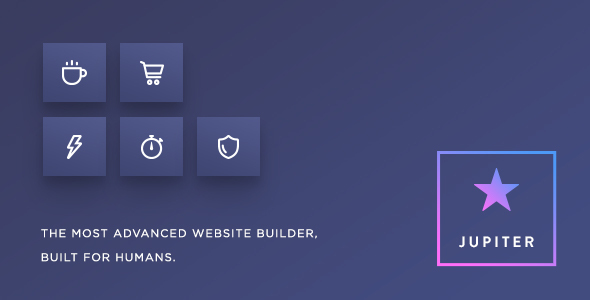 ProGuards is integrated with Visual Composer, Revolution Slider, Swiper slider, WPML, Essential Grid, and more popular plugins. ProGuards knows how to make things easier for its users and its theme admin panel is extremely user friendly and intuitive. Express your creativity with this impressive theme! Safeguard has a beautiful, distinct design ideal for security companies. This impressive premium theme will help your business stand out from the crowd and create an impactful first impression. The developers behind Safeguard did a beautiful job at adding only flexible and powerful features. A few of its features are unique service pages, blog layout, premium plugins for free, demo content included, font icons loader, powerful theme admin panel, child theme included, and a professional support forum. 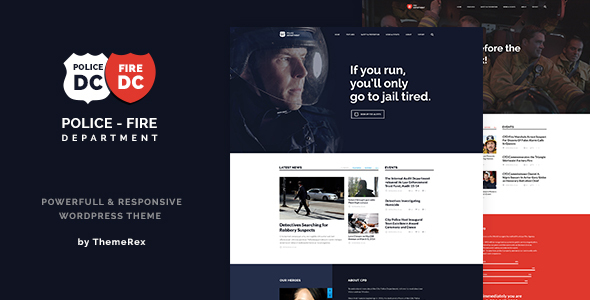 Police and Fire DC is a theme developed and targeted for police and fire departments, security companies, governmental organizations, and any other security related websites. In order to be a perfect fit for any of these websites, this theme has been packed with useful and niche-related features. You will have no problem learning how to use the theme’s features because it comes with a detailed and extensive documentation, as well as a dedicated support team always there for you. You can choose from the 2 pre-built skins, or create one yourself by using the theme admin panel. Your website will look perfect on any devices, screen resolution, and browser because Police and Fire DC is 100% responsive. 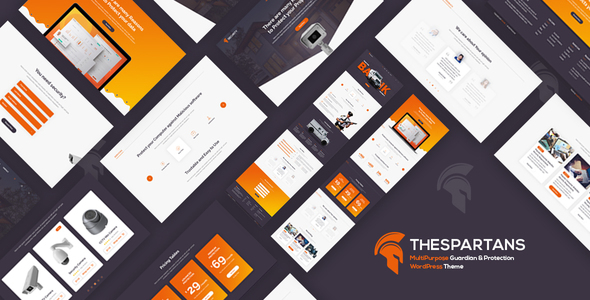 TheSpartans is a fantastic, slick, stylish, up to date, and fully responsive WordPress theme for security companies. It is the perfect choice for this niche because of the smooth and easy to navigate design, as well as the impressive features. You can customize the theme through the admin panel using the typography options, theme colors, different homepages, shortcodes, header styles, custom widgets, and others. Combining all these elements you can create a website like none other and impress your audience. It’s important to stay relevant when having an online presence. 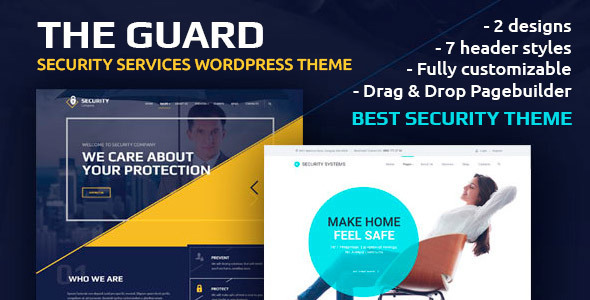 The Guard is a spectacular, high-quality, creative, professional, versatile, and smooth security company WordPress theme. Apart from its impressive and pixel perfect design, this theme was also performance optimized to focus only on the most important aspects of your website and content. The Guard is a pleasant theme to interact with and includes 2 awesome designs, unlimited color variations, more than 40 page elements, 100 content blocks, Revolution slider, Visual composer, Ultimate addons, Iconic set, All in one widget pack, header layouts, customizable sidebars, and much more. If you use The Guard your website will remain modern and elegant for many years to come. The talented team behind this impressive WordPress theme deserves our applause for crafting such an intuitive, user friendly, modern, visually stunning, and clean template. No matter the type of security services your business offers, this theme will improve your website as well as your conversion rate. Security includes features such as support for various custom posts, official WPML certification, 80 shortcodes, multiple color options, free updates for life, custom widgets, filterable portfolio, awesome sliders, and many more. Security provides you with the key to success! Fire dept. 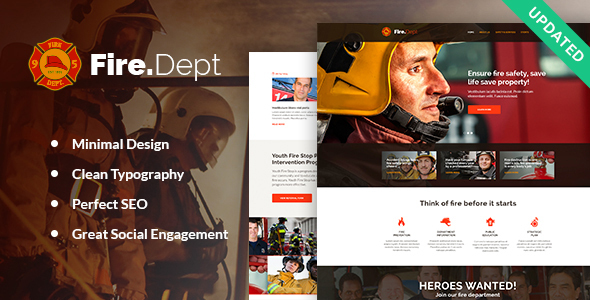 is a modern, unique, and reliable WordPress theme perfect for fire departments, police departments, and security companies. It will perfectly highlight what you do, members, and other important information your users might find useful. Fire dept. is fully responsive, has multiple homepage layouts to choose from, comes included with Visual Composer and Revolution slider, and WooCommerce compatible. This premium theme is also SEO optimized, which is important in order to naturally grow your rankings. The7 is a perfectly designed and developed multipurpose WordPress that can be easily used for security services and companies. It is packed with incredible features and highly customizable design elements. If you purchase this theme you also get 6 free premium plugins, free lifetime updates, 31 pre-designed demos, and 24/7 professional support. The installation is fully automated and using the one click demo import option you can have a complete website in minutes. The7 gets the job done! 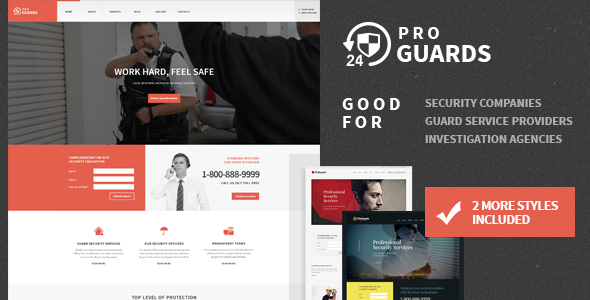 Prodefence is a beautiful, unique, appealing, versatile, and highly customizable security services WordPress theme. Without a doubt, it’s going to be a great addition to your website and business. Prodefence will help your website look amazing no matter the device used, as well as grow your rankings thank to its SEO optimized code. The demo content comes in handy for beginner and advanced users alike. To learn more about this theme you can go and check its available demo! 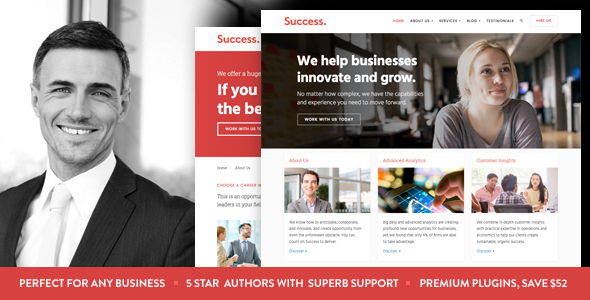 Success is a professional, flexible, fast, efficient, engaging, beautiful WordPres theme. This is a highly pliable premium template adaptable to any type of content and business. Success is very easy to install and you can easily create stunning layouts with the included drag and drop page builder. You will have no trouble getting indexed or boosting your rankings thank to the clean and optimized code Success was built on. Get it for a test drive through the live previewer. Stash is developed by an elite author, HighGrade, and is an elegant, stylish, clean, modern, and responsive WordPress theme. This theme pays incredible attention to details and provides over 45 homepages demos, which can be easily installed through the one click demo installer available. This is a multi-purpose them and it has a large variety of features including 80 page elements, over 250 customizable design elements, 15 page templates, 7 pre-built portfolio layouts, WooCommerce integration, 2 premium slider plugins, and several other options. 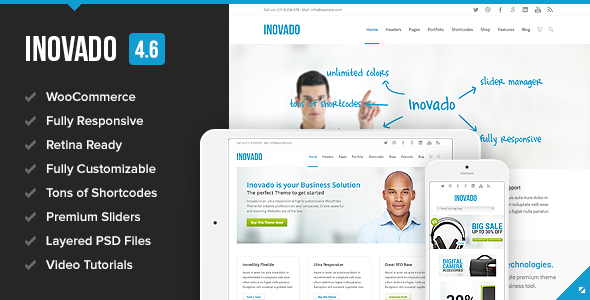 Next we have Inovado, a multipurpose WordPress perfectly pliable to any type of business. If you want to have a successful and professional website for your company, then Inovado is the theme for you. This theme puts the focus on its features and design. Using it you can craft a unique and aesthetically pleasing website in no time. Inovado comes with a fully responsive design, WooCommerce support, built-in mega menus, an advanced admin panel, more than 25 pre-made layouts, sticky headers, tons of shortcodes, and premium sliders. Try it today! 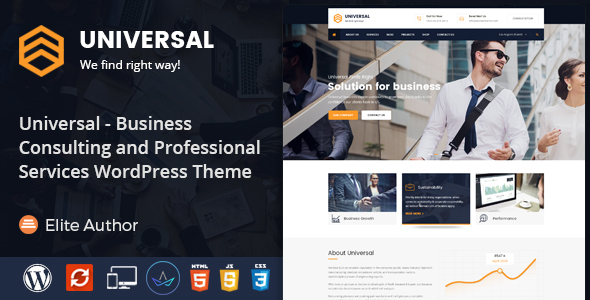 Universal is a classy, colorful, gorgeous, attractive, stylish, and highly customizable WordPress theme. Within this theme you will find awesome tools, beautiful elements, and pre-built options. Universal offers two premium plugins bundled with the theme: King Composer PRO and Slider Revolution. You can use both to create stylish and engaging page layouts. Also available with the theme are the demo content, advanced typography options, unlimited colors, child theme, PSD files, detailed documentation, social links, various widgets, and unlimited sidebars. Use Universal for your company! Jupiter is a colorful, vibrant, modern, attractive, creative, responsive, and customizable multipurpose WordPress theme. Jupiter was designed to satisfy any business’ needs and make a long lasting first impression no your visitors. Jupiter includes powerful theme features and tools among which are the 140+ pre-built demos, cross tab synchronization, customizable header, background selector, beautiful slideshow, over 100 page elements, various plugins for free, adaptive image resolution, and free add-ons. You cannot go wrong with Jupiter. Even if there are not that many security services WordPress themes, we believe we have put together a useful article with some of the best choices. If you have any questions, or you believe we missed a theme that would fit this list, let us know in the comments below.